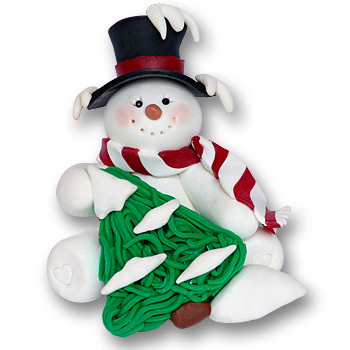 This darling little snowman is a 3 dimensional ornament which can be used as a shelf decoration or as a hanging ornament. It is handmade from polymer clay and designed by Debi Allison. Comes complete with a hook and satin ribbon for hanging. May be personalized on the snow at the bottom of the tree. Measures approximately 3½" x 3"